Too often on Broadway, musicals sacrifice brains and depth for joyous, get-up-and-dance production numbers, as if the two couldn’t coexist in the same show. Rob Ashford’s revival of How To Succeed In Business Without Really Trying is that rare production that manages to provide audiences with both. 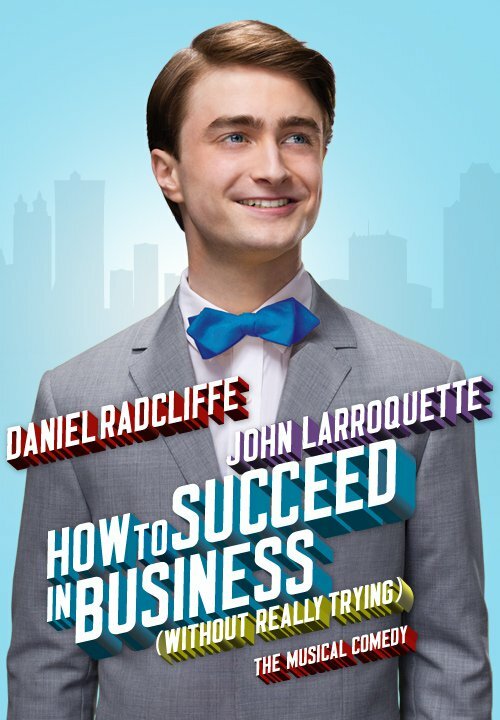 Daniel Radcliffe of Harry Potter megafame stars as J. Pierrepont Finch, the window washer at the World Wide Wicket Co. who cunningly works his way up the corporate ranks. This is Radcliffe’s second Broadway bow, following a fantastic debut in the psychological thriller Equus in 2008. To answer the questions on everyone’s minds—yes, Radcliffe can sing and dance along with an ensemble full of Broadway babies, born and bred. While his vocals never rise above adequate, Radcliffe both executes and contributes to director Ashford’s lively and challenging choreography. Ashford cleverly crafted choreography around Radcliffe’s physical traits. 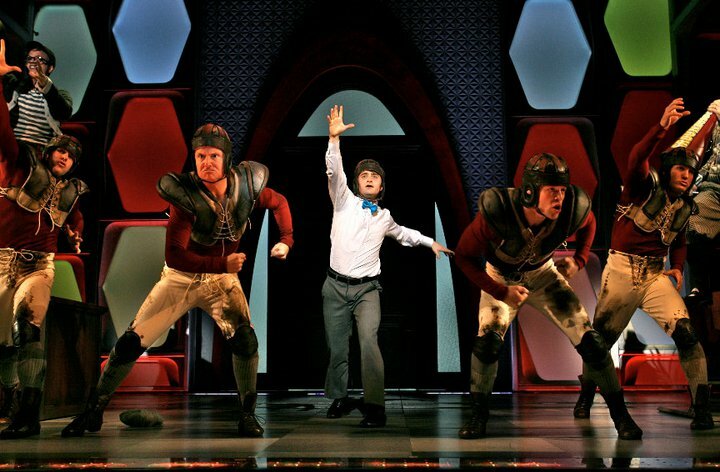 During the college-football inspired number “Grand Old Ivy, the ensemble literally lifts and tumbles Radcliffe around as if he were a five-foot pigskin. The effect is nothing short of hilarious, as is Radcliffe’s approval of the physical gag. “Grand Old Ivy” and others like “Brotherhood of Man” display a level of choreography and production value that is filled with such life and invention; How To Succeed surely offers some of the best Broadway spectacle this season. Yet as stated earlier, How To Succeed is also a witty story with smarts. Much of this comes from Radcliffe’s portrayal of Finch. He deceives and manipulates his way to the top of the company without displaying any real skill, yet there is not one bit of maliciousness in Finch’s actions. This is simply a man who is looking to better himself in the American way—the quickest, easiest way he can. In this respect, How To Succeed is a reflection of the ambitions behind today’s recession in the least heavy-handed way. Everyone is looking out for themselves for their own financial protection. Without getting too serious about it, this production speaks to that in an effective way. A strong supporting cast aids Radcliffe in carrying this revival to the top. Five-time Emmy winner John Larroquette dryly hams it up as the company’s CEO who becomes smitten with Finch’s young talent. Larroquette and Radcliffe share a warm chemistry that sparks in their shared number “Grand Old Ivy.” Christopher J. Hanke has a lot of room for character embellishments as the spoiled subject of nepotism Bud Frump, and he doesn’t waste a moment. Although the show is fun all around, Hanke looks like he’s taking the top prize every night. Tammy Blanchard adds a welcome heap of vapid femininity as the the dim-witted secretary Hedy La Rue. Her clueless smile and classless excitement spill charm all over the stage. Matching well with the bubbling tone of the high-energy musical numbers are Derek McLane’s sets. A polygonal mosaic, the many panels excitedly flash bold, bright colors throughout the show, adding a wonderful element of flamboyance with style. And Catherine Zuber’s costumes—all I can say is where can I purchase these suits for myself? All the men give Don Draper stiff competition in these handsome 1960s suits. When so many shows claim to provide “something for everybody,” How To Succeed truly delivers. With exhaustive and precise choreography and a storyline that provokes thought, but doesn’t darken—this is a production that packs it all in at Broadway’s highest quality. I thank the cast and the creative team for really trying. Up to two general rush tickets may be purchased for $30 each when the box office opens. Awww, Harry Potter is all grown up! I had know idea that he was in How to Succeed! This musical provided an all inclusive night of entertainment and a trip back to simpler times. The set and costumes allowed me to escape to the 1960’s for a few hours with a light-hearted poke at office politics. It was refreshing to see how far a good idea can get someone, both in the office and in life if they are willing to take a gamble and capitalize on acting on our “true” human behavior most people choose to deny. I love how the set progressed from stale gray to vibrant rich colors as the promotions were rewarded and the world took on a different view. Just one elevator ride can change a life….